Of special note are the stats (and line drawings) of the characters from the D&D toy line, and also made special guest appearances in the D&D cartoon series of the early '80s: Mercion (cleric), Figgen (halfling), Peralay (elf), Elkhorn (dwarf), Ringlerun (magic-user), Strongheart (fighter), Fox Fingers (thief), Zargash (cleric), Zarak (thief), Skylla (magic-user), Kelek (magic-user), Raven (cleric), and Warduke (fighter). "The Shady Dragon Inn is a set of pregenerated characters for use with the DUNGEONS & DRAGONS game. This player's aid comes in two parts: each character appears first in a section devoted to his or her character class. They appear again in the second section as members of a party. As a DM or as a player, you may use either or both sections; over a hundred characters await you! 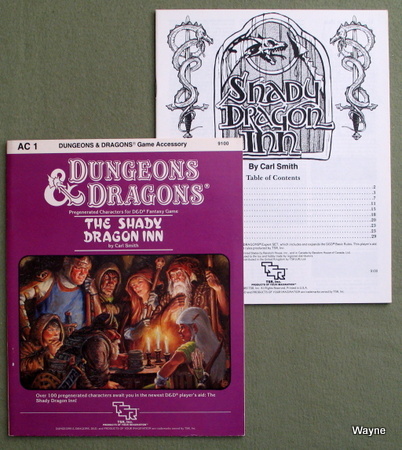 The Shady Dragon Inn also contains the D&D game statistics for those special characters who are presented by figures in the D&D and AD&D toy line, a provides a tavern setting from which players may start adventures or gather party members." "You're guiding your party through a dense swamp. Suddenly, the jaws of three large crocodiles snap menacingly. The fighter draws his sword, and the magic-user prepares to cast a spell. The crocodiles creep slowly closer. Time out. You have to find the tables in the rules. Resolving combat is just a dice roll away if you have the D&D Combat Shield. All the tables you need are included on this handy 3-panel screen: monster hit rolls, saving throws, armor class, variable weapon damage, and several others. Experience tables for each character class are also given. 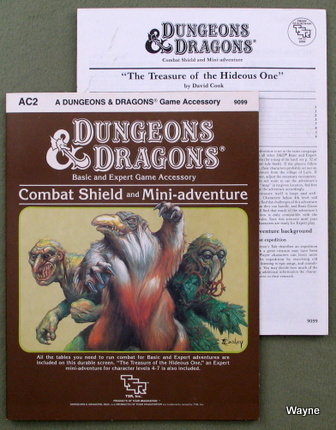 The Combat Shield also comes with an Expert Game mini-adventure: "The Treasure of the Hideous One." The adventure features a ready-to-use treasure "map" that you may introduce into your campaign when your players find clues to a lost treasure. Several interesting "encounters" are thrown in, too, so you'll have plenty of chances to use the Combat Shield. "Your party moves stealthily up the dark hallway. Torn cobwebs dangle from the ceiling; to the south, a huge, iron door creaks eerily in the mysterious wind. A massive iron gate crashes down, blocking the corridor ahead! Wait a minute. The pencil broke. Mapping dungeons is quick, easy, and exciting with the 3-D Dragon Tiles. 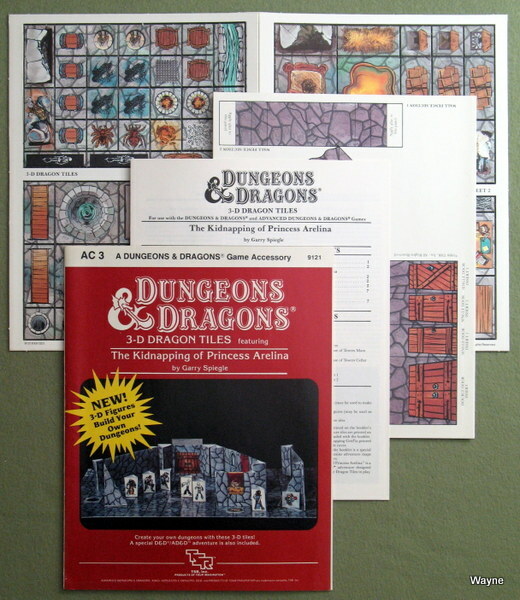 Use the Dragon Tiles to bring your DUNGEONS & DRAGONS and ADVANCED DUNGEONS & DRAGONS adventure to life. This package contains 51 3-D figures, featuring characters, creatures, walls, and doors. 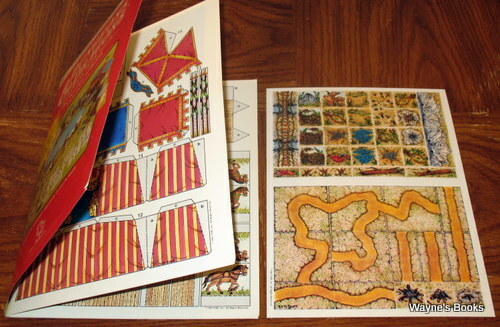 Two sheets of 84 two-sided feature tiles, showing traps, treasures, furniture, and special surprises, are also included. A Dungeon Mapping Grid is provided to help you lay out dungeons quickly. The 3-D Dragon Tiles also comes with a special D&D/AD&D adventure, "The Kidnapping of Princess Arelina." Can't find an eraser? Don't worry. Leave the dungeons to us." And now you, too, can learn the secrets that were revealed to Phaedras! 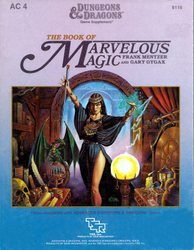 The Book of Marvelous Magic is the ultimate sourcebook on magical items and their twists and quirks. Over 500 new magical items are described in detail. 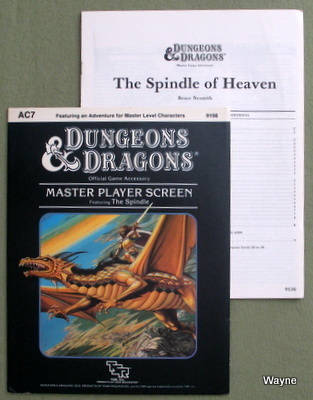 An appendix describes how these items can be used with the AD&D game." 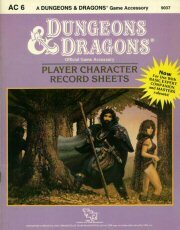 This is a re-covered later printing of the 1980 blue cover character sheets. The green character sheets are identical. I don't see this edition often; probably didn't have a long print run. "Do you have trouble keeping track of your dwarf's hit points? Are you constantly checking to see what your thief's abilities are? Did your magic-user miss going up a level because you lost the piece of paper with all of his treasure on it? Well cast your gaze upon this item. At last, all of that valuable information has been place on one sheet of paper. These convenient record sheets display all of the most frequently used information that a player looks for when adventuring with a character. Everything you want to keep track of can be kept on these sheets. Ability scores, armor class, hit points, weapons, spells, treasure, equipment, magical items, saving throws, special abilities and even a combat table are placed at your fingertips." "You started in Basic and as your character grew, you advanced to Expert. And the game grew too, expanding into Companion and Masters rules. And your character grew right along with the game, gaining levels, equipment, magical items, and land. In fact, your character grew right out of the D&D Character Sheet you have been using for so long. Now your character sheet can keep up to date with the game. Need a space to note weapon mastery from the Master Rules? Has your character's spellbook grown into a maze of paper scrap? Forgotten the name of your fighter's liege lord? Now you can record these on a single clear sheet with the new and expanded D&D Character Sheets. Specifically designed for use with all the D&D rulesets, these character sheets allow space for information that pertains to all the details of the growing D&D gamesystem. 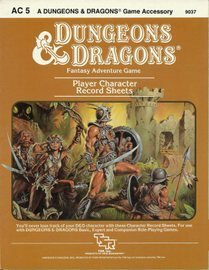 The D&D Character Sheets come with 16 two-sided character sheets suitable for use with all characters, 8 Character Spellbook Planners complete with all Magic User, Cleric, and Druid spells, and a Dominion Planning Guide." "For the first time, all the important tables and information for character classes has been gathered together in this easy-to-use accessory. This screen collects all the crucial information for player characters, from beginning to master level. This fabulous product includes Level advancement, spells and weapons tables: Saving Throws, Combat and Special Abilites. Also featured is the Master level mini-adventure, The Spindle, the beginning of a quest for the secret of immortality. This adventure provides players and DMs alike, with a foundation from which to create their own epic quests into legend and beyond." This package includes 3-D figures featuring tents, trees, carts, a waterfall, and characters. A sheet of 2-sided tiles include trails, streams, creatures, and other wilderness features. A wilderness mapping grid is included to help you lay out wilderness encounters quickly. 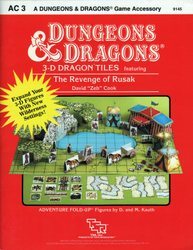 The 3-D DRAGON Tiles also comes with a special D&D adventure, The Revenge of Rusak." Compiled by TSR's UK staff at the time, this sourcebook contains a couple hundred creatures, including: Juggernaut, Soul Eater, Shroud Spider, Aquatic Beholder, Death Demon, Sabre Claw, Undead Dragon. "Are you ready to face the horror of the Hivebrood, the gruesome Geonid or the dread Dusanu? These and many other baleful beasts lurk within the pages of this manual, waiting to challenge even the mightiest adventurers! 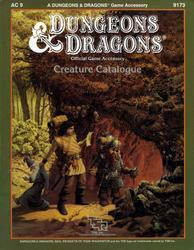 The Creature Catalogue is the first major expansion to the range of D&D game monsters. Within its covers have been collected all the curious creatures first presented in the official D&D adventure modules, plus many more new nasties, designed to challenge and perplex the heartiest heroes. Also included is a comprehensive index of all D&D monsters found in the Basic, Expert, Companion and Master rulesets. Whether your players' characters are 1st, 21st, or 31st level, this tome contains many fantastic creatures with which to test their mettle. Armed with the Creature Catalogue, you will be able to find the right fearsome foe to confront even the most foolhardy fellow." Set aside the booklet of mini-adventures, I like the Dragon Spell Generator. The various dragon types in classic D&D are often limited spell-users, making them even more formidable adversaries in the hands of a clever DM. The Spell Generator does exactly what it claims, and allows for the quick creation of a spell-using dragon, by color type. The Generator also has stat blocks of all the D&D dragons for quick reference. The random spell generator the back cover blurb is referring to is the inner 3-panel cover (the outer cover is 2-panel). One leaf of the inner cover has lists of spells, the other two leafs having punch-outs allowing only certain spells to be revealed. An errata sheet also comes with the accessory, because TSR missed a few spots to punch-out, so the errata sheet serves as a template for DIY cutting. This dragon spell generator is frequently missing from used copies. Like Red Dragons? Visit my Games Gallery blog post about early David C. Sutherland red dragon art. "Red dragons. Storm giants. Dragon rulers. Frost giants. They're all here, in this book, in complete, ready-to-play mini-adventures. No matter what level your characters are, there is something here for you (and them). This product includes a random spell generator for dragons, complete with instructions. This accessory is for use with the D&D Basic, Expert, Companion, Masters, and Immortals Rules sets produced by TSR Inc. The adventures contained herein cannot be used without these rules sets." "Have you ever wondered why, in a world full of magic, there are no enchanted labor saving devices? Few magical modes of transportation? No bespelled byproducts of the inventor's art? Wonder no more! They are all here, in this latest compendium from the Game Wizard's lair: The Book of Wondrous Inventions! 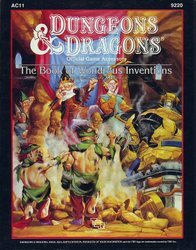 The Book of Wondrous Inventions is useable with both the D&D and the AD&D game systems. Each invention is clearly outlined, including function, form, and hazards of use. Statistics and spell details are are presented in a manner compatible with both game systems. Adventure scenario suggestions are given, as well as design instructions for characters who wish to build duplicate device. As an added bonus, a section is included which details a system for creating spells and magical items. This will prove especially useful to players and DMs who use the D&D game system; the detailed information is also of help to AD&D game players."